Epiphone Emperor Model Arch Top Acoustic Guitar (1955), made in Philadelphia, PA, serial # 69122, sunburst lacquer finish, maple back and sides, spruce top; laminated maple neck with rosewood fingerboard, original brown alligator grain hard shell case. This is a truly lovely example of the final version of the original non-cutaway Epiphone Emperor, the company's top of the line acoustic instrument. At the time this one was made, the originally New York-based Epiphone company was on its last legs but still capable of the finest work. According to the serial number data compiled by Jim Fisch and L.B. Fred, this guitar is one of the final batch of the original style Emperors ever made. The entire company was sold to CMI/Gibson early in 1957, and the Emperor was continued as a Gibson model but only as a cutaway, so this guitar is literally one of "The Last Emperors" -- at least in its original form. 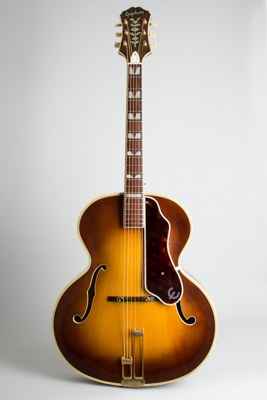 The Epiphone Emperor was developed in 1935-36 as the company responded to arch-rival Gibson's newly "Advanced" archtop line. As Gibson launched the ultra-fancy 18" Super 400, Epiphone responded in kind with an even larger guitar at the same level of opulence. With a $400 price tag, these models were only affordable to the best professional users, and through the swing era Gibson and Epiphone vied to entice the top name players to feature them. Evidence suggests that the Emperor may well have outsold the Super 400 at the time. Original high-end acoustic archtop Epiphone guitars were very popular among professional users when new, but nice examples are surprisingly hard to find today. The body is a full 18 1/2" wide, made of figured maple and fine-grained spruce with too many layers of binding to count! The neck is a multi-laminate of maple and walnut, with a figured rosewood fingerboard, triple-bound and ornamented with pearl and abalone split blocks. The headstock is also triple-bound and inlaid with the "tree of life" pearl pattern that was an Epiphone trademark. The tailpiece is the two-tine Frequensator particular to the company as well. This guitar is extremely attractive overall and has the typically huge Epiphone tone; you could easily drive a big band with it! While the guitar has a lot of power it has a subtler side as well, with a mellower tone than some when played lightly, and is an excellent chord/melody machine as well as a very fine all-around archtop. Some have said that the later Epiphones from the Philadelphia workshop are inferior to the New York models made in 1951 and earlier; this guitar does much to disprove that supposition, at least as far as the top-line guitars are concerned. Overall length is 44 in. (111.8 cm. ), 18 1/2 in. (47 cm.) wide at lower bout, and 3 7/16 in. (8.7 cm.) in depth, measured at side of rim. Scale length is 25 1/2 in. (648 mm.). Width of nut is 1 11/16 in. (43 mm.). This is a very clean guitar overall, not showing a lot of use. Most of the hardware is original, including the unique "E" logo tuners and Frequensator tailpiece, the latter of which has a typical repair to the bend in the baseplate. The pickguard is a very expertly made replacement, and looks nearly identical to the original. The bridge appears somewhat more recent, or at least the saddle does, and there is another saddle in the case pocket that has a repaired crack through the center. There is a strap button added to the side of the neck heel. The beautiful and fairly light tobacco sunburst finish has very little wear or checking; there is one sizable touched-up area on the top, between the pickguard and the bottom edge of the lower bout. This is due to the deterioration of the original pickguard, which left a streak of dark staining as the celluloid liquefied. This has been very well cleaned up and just that area carefully blended in. The work was very well-accomplished, and the result is more attractive (and less evident) than many similar jobs we have seen. There is a tiny crack in the spruce off the top edge of the bass side f-hole -- it is sealed up under the original finish and appears to be a factory job. All the elaborate layers of multiple binding are solid; there is some light shrinkage in a few spots in the waist areas and at the joins on the back, but none of the heavy deterioration some period East Coast guitars suffer from. The frets and fingerboard show only slight wear as well; the original fret wire is quite small, but the guitar is still an excellent player with the expected huge sound. Even at the end, the old hands at Epiphone were capable of crafting world-class guitars; one strum on this elegant survivor proves that without a doubt. It still resides in its original alligator-grain HSC -- the same pattern as period D'Angelicos were sold with. Excellent Condition.